In Star Trek 2: The Wrath of Khan, the antagonist Khan (a previous TV episode shows he is a 19th century warlord who was banished and put in a deep freeze for 200 years apart from humanity) is set free and wreaks havoc on Captain Kirk. It’s the best of the Star Trek movies, so you know the story if you are still reading this post. KIRK: He won’t break off now. If he followed me this far he’ll be back. But from where…? KIRK: Mr. Saavik, all stop. KIRK: Descend ten thousand meters. Stand by photon torpedoes. Kirk moves in three-dimensional space and sinks below Khan, only to rise up as Khan passes and disable the ship from behind to win the day. How did Spock know this weakness of Khan’s? In the beginning of the movie when Khan is found in his wayward spacecraft by Chekov, we see there’s a chessboard on the ship. It’s one we would recognize as the same one we use today, which makes sense because Khan is from the 20th century (in science fiction chronology, obviously). But somewhere over the 200 years since Khan, humanity came up with three-dimensional chess, pictured above, which plays chess but in three dimensions. Pieces can move diagonally or horizontally through the levels and attack from above and below. Here’s Leonard and Sheldon playing the game in Big Bang Theory. So the classic game of chess with its intricacy was given a third dimension which opened up a thousand more strategies and perceptions. No matter how genius Khan was, Khan had spent centuries mastering a game that was not the best it could be. Adding a third dimension, Kirk and Spock, even if they were not the same level of masters at the game that Khan was, knew something more than Khan did because of the third plane. And they used that dimension to defeat Khan and win the day. In Jesus’ time, the Pharisees were masters of their game. Israel was an occupied nation, the Roman army all around. They figured that they had two options: fight and risk their culture being destroyed (like the Zealots) or retain their culture through heightening purity laws and understandings so that the the Roman “dirt” wouldn’t get into the temple. The Pharisees chose to play the game forced upon them by the Romans. They became very good at the game and perpetuated their culture even during occupation. Jesus came and showed that the Pharisees had become masters at the wrong game. They had made closeness to God into a hierarchy, entrance to the holy of Holies into a popularity contest, and left the widows and the orphans at the gate. He introduced something powerful into the game: a third dimension where God became human and offered a new path towards salvation. The Pharisees, seeing their antiquaited ways, chose to react out of fear of preservation of their game where they were masters rather than embrace a new MMORPG game where they would start out with zero experience like everyone else. It seems to me that every prophet following Jesus also introduced a new dimension to the “game.” Luther challenged the Pope and redefined the relationship between tradition and Scripture in our Christian theology. Wesley introduced grace to combat the Calvinism of his day, with explosive results throughout history through the Methodist and the Pentecostal movements. Every monk, nun, mystic, renegade found a layer of the Christian story that they wrapped themselves in and invited others to be wrapped in it too. One of the mission points of “hacking” Christianity is freeing the source, or recognizing that the divine is exponentially more available to us than we ascribe paths or interactions to/within/through the divine (or “the more”). Changing the game in Star Trek opened a third dimension and made a thousand strategies become exponentially higher. Changing the Temple culture in Jesus’ time opened a third way for those kept from the temple to follow God’s dream for them. John Wesley’s understanding of grace, for this blogger, offered a third way between the predestined stories of my childhood and the uncentered culture of my 30s. So what can you do today to continue this tradition? Is there a situation in your life that needs a rising above? Like my sermon on the Kobayashi Maru, is there a situation where you can cheat the system for the greater good? Is there a situation aching for justice that needs a novel third way that turns back the tide of injustice? What is the next dimension that you can introduce and swim in and invite others to swim in it too? The truth is that every situation that you are in has another dimension that gives a new perspective. And every church system has its technocrats that find themselves back at Zero XP when the church culture game changes. And every justice issue has the prophets and the culture touchtones that turn back the inertia of injustice in the long run. I’m sure of its possibility, even as we may be unsure of how to apply it. Yet. Talking to my son yesterday, I realized that Capt. Kirk was a master at “changing the game”, as you put it. The original series episode “The Corbomite Manuver”, at one point Spock says “Checkmate. The game is over.”. 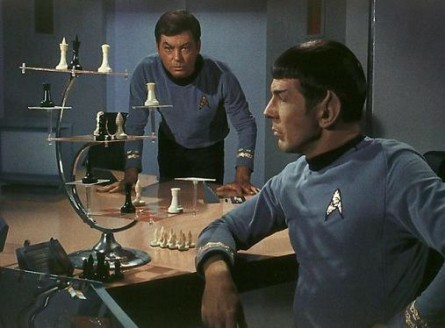 Kirk is not happy with this, and after some thought, he says, with a sly smile: “Not chess, Spock….Poker!”. I love the way you compare the work of a prophet with 3d chess. Prophets must move in 3d space while we continue to think in 2d. Could Discipleship be an RPG?